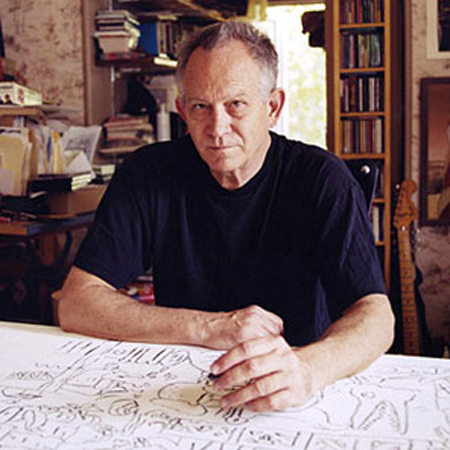 Gary Panter was born in Oklahoma and raised in Texas. He studied painting at the East Texas State University and moved to Los Angeles in 1977. In L.A. he worked on multiple fronts, including painting, design, comics, and commercial imagery, establishing a pattern of creating across traditional boundaries, and in multiple media, that endures to this day. In the late 1970s he exhibited his first major suite of paintings and drew posters and fliers for the likes of The Germs and The Screamers. He also began a long association with the various incarnations of Pee-wee Herman, as well as creating the early adventures of his punk/nuclear/hillbilly alter ego, Jimbo. In 1980 Gary published “The Rozz-Tox Manifesto”, a highly influential document that directed his generation to infiltrate the mainstream with underground ideas and culture. Gary’s paintings occupy a large portion of a very prolific 1980s, during which he also designed the sets and puppets for Pee-wee’s Playhouse, completed record covers for the likes of The Red Hot Chili Peppers, and maintained an active comics output through his own mini-comics and his contributions to Raw magazine and other anthologies. Returning to comics in the early 1990s, Gary drew seven issues of a Jimbo comic book. He then began delving into light shows, staging elaborate psychedelic performances in his studio space. More recently, he has collaborated with Joshua White, and the duo has mounted lightshows at the Hirschhorn Museum in Washington, D.C. and at New YorkÕs Anthology Film Archives. In 2006-2007, Gary was a featured artist in the touring exhibition, Masters of American Comics. His paintings and drawings have recently been exhibited at Dunn and Brown, Dallas and Clementine Gallery, New York. In 2008, Gary was the subject of a one-man show at the Aldrich Contemporary Art Museum. His books include a comprehensive monograph, Gary Panter (PictureBox), and four graphic novels: Jimbo in Purgatory (Fantagraphics); Jimbo’s Inferno (Fantagraphics); Cola Madnes (Funny Garbage); Jimbo: Adventures in Paradise (Pantheon). Gary has won numerous awards, including three Emmy Awards for his production design on Pee-wee’s Playhouse, as well as the 2000 Chrysler Award for Design Excellence. Gary Panter lives and works in Brooklyn.